The OIF is a public funding mechanism that reviews proposals throughout the year. It is not necessary to join PowerAmerica to make a submission, but any submission selected for funding will include a requirement that all participating organizations join PowerAmerica prior to receiving funding. The OIF provides funding to demonstrate the benefits of silicon carbide (SiC) and gallium nitride (GaN) technologies in a range of products and industries. Funded projects can receive up to $225,000 for up to a 12-month period from PowerAmerica, and require a 1:1 cost match from the recipient. White paper submissions are evaluated on a rolling basis. How Does OIF Differ from the Annual Call for Projects? The OIF does not specify the project objectives or technical targets. Instead, it offers companies operating in the United States an opportunity to propose innovative projects that advance PowerAmerica’s mission to make WBG semiconductor technologies cost competitive with Si based power electronics, and to accelerate the adoption of SiC and GaN based components in high value markets and applications. The OIF support this mission by funding targeted, high impact projects that address key unmet technical gaps throughout the WBG semiconductor supply chain. Technology readiness at the proof-of-concept level should exist prior to funding. Of particular interest are projects that can accelerate product demonstrations up to the point of pilot production. Submit a non-proprietary white paper (4-5 pages max) to directly to the Member and Industry Relations Manager Jim LeMunyon at jim.lemunyon@poweramerica.ncstate.gov. Include an estimate of the total cost of the project, the proposed use of PowerAmerica’s funds, and how costs will be matched 1:1 by the organization. Proposals are strongly encouraged to include teams in which one or more participants is a likely customer of the product or systems to be improved by SiC or GaN technology. 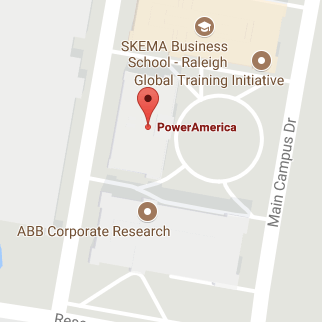 Those interested in teaming with a current PowerAmerica academic partner can find contact information here. Contact Jim LeMunyon, Director of Membership and Industry Relations, at Jim_LeMunyon@ncsu.edu.